The other day, while cleaning out my desk, I found this eraser. I bought it while on vacation with my sons in Zagreb, when I was deep into my separation with my husband at the time. While walking the old town of Zagreb we happen to stumble upon the Museum of Broken Relationships. How appropriate, I thought. Imagine a whole museum dedicated to what I was going through. It was amazing because it addressed every emotion and struggle that I was going through at the time. 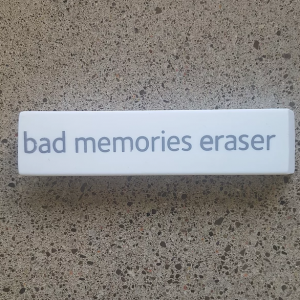 And my souvenir was this “bad memories eraser”. During that time, I had to develop ways to cope through the daily trauma and the most effective techniques I used ranged from positive self talk to many many mindfulness techniques. The technique that become my go-to, was to instantly become present. This is one of my favourite ways to become present. Quick and easy ways to become present are key. Where ever you are now, close your eyes, breath deeply into your belly and focus on the sounds around you …. the traffic, the birds, the wind. Now focus on your skin… the feeling of your clothes on your arms, your legs, your scalp, your face. Are you sitting or standing? How do your feet feel on the ground. Breathe deeply. Now come back by opening your eyes. Using this technique of being in the present saved me. It took me out of my head where all the bad memories are and helped to change the energy in my body. Now nine years later, the memories are still there, but they no longer hurt the way they used to.